The perception of engineers is all wrong in the media – science and Maths is fundamental to what they do. They create the illusion of simplicity by operating with very complex system. Way more lines of code are required to operate a car than a military jet! Good engineering practice is helping cars to reduce their carbon impact. There is a case for electrification but still a long way to go to being able to move to batteries. Batteries take a lot longer to charge than filling up at a petrol station. However the best opportunity is to have batteries charged using renewable energy sources. Jaguar are developing a hybrid supercar – the technology’s there but currently very expensive. Don’t have the volume of qualified engineering graduates to match growth. Big gap is in electrical and electronics engineering. Insufficient students taking STEM subjects. There are insufficient numbers of women in the automotive industry. In the EU we have the fewest women in engineering at 8.7%, Latvia has the most at 30%. The lack of skilled engineers coming through is a significant barrier to growth in advanced manufacturing. 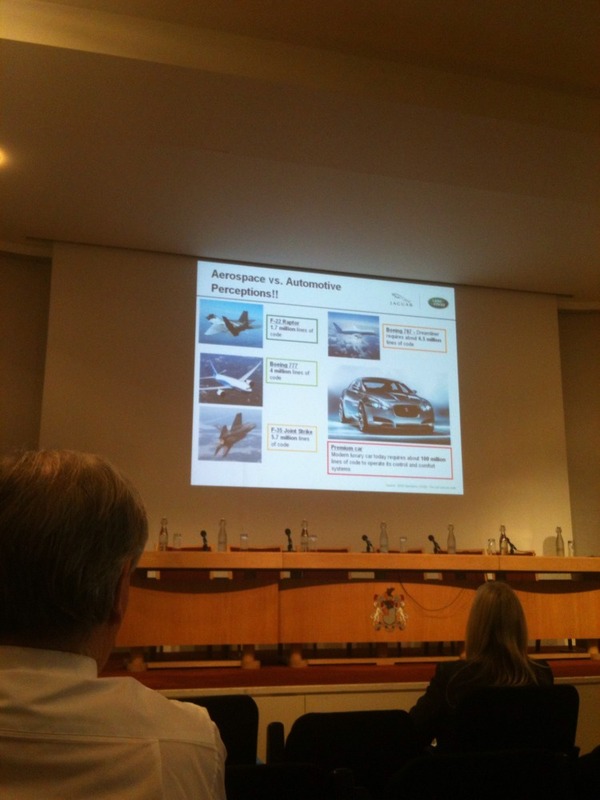 Automotive is competing with other high tech industries for skills. We need to grow the number of students studying science and Maths.